Close to 35 per cent of Bulgarians smoke, the highest rate in the European Union – higher than in Greece, formerly the EU’s heaviest-smoking country. This emerges from new figures, from 2014, released by EU statistics Eurostat, which said that 43.3 per cent of Bulgarian men smoke, as do 26.8 per cent of Bulgarian women – both well above the EU averages of 28.7 per cent among men and 19.5 per cent among women. Bulgaria also was high in the rankings for passive smoking. The rate was 40.5 per cent, second only to Croatia’s 44.7 per cent. Eurostat noted that while the percentage of Bulgarians who smoked was 34.8 per cent, about 28.2 per cent smoked on a daily basis while the rest of those who lit up were “occasional” smokers. The next highest rates of smokers, after Bulgaria and Greece, were Austria (30 per cent), Slovakia (29.6 per cent) and Latvia (29.5 per cent). While slightly more than three-quarters (76.0 per cent) of those aged 15 or over living in the European Union (EU) were nonsmokers in 2014, 19.2 per cent smoked some kind of tobacco products on a daily basis and a further 4.7 per cent on an occasional basis. 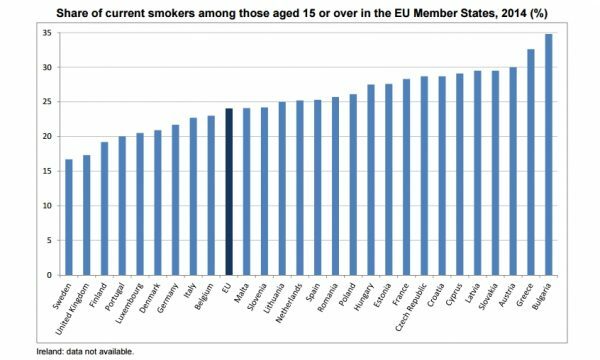 In other words, nearly one in every four people (24 per cent) aged 15 or over in the EU was a current smoker in 2014, Eurostat said. Among EU countries for which data are available, the lowest shares of current smokers in 2014 among the population aged 15 or over were recorded in Sweden (16.7 per cent) and the United Kingdom (17.2 per cent), ahead of Finland (19.3 per cent), Portugal (20.0 per cent), Luxembourg (20.4 per cent), Denmark (20.9 per cent) and Germany (21.7 per cent). In the EU, about one in five people (21.6 per cent) aged 15 or over was exposed daily to tobacco smoke indoors in 2014, with large differences among EU countries, Eurostat said. Nearly two-thirds (64.2 per cent) of the population in Greece were exposed daily to tobacco smoke indoors. High proportions of passive smoking were also registered in Croatia (44.7 per cent), Bulgaria (40.5 per cent) and Romania (37.6 per cent). In contrast, the lowest shares were recorded in Sweden (5.9 per cent) and Finland (6.3 per cent), followed by Portugal (8.6 per cent) and Hungary (9.9 per cent). In these four EU countries, passive smoking affected less than 10 per cent of the population.